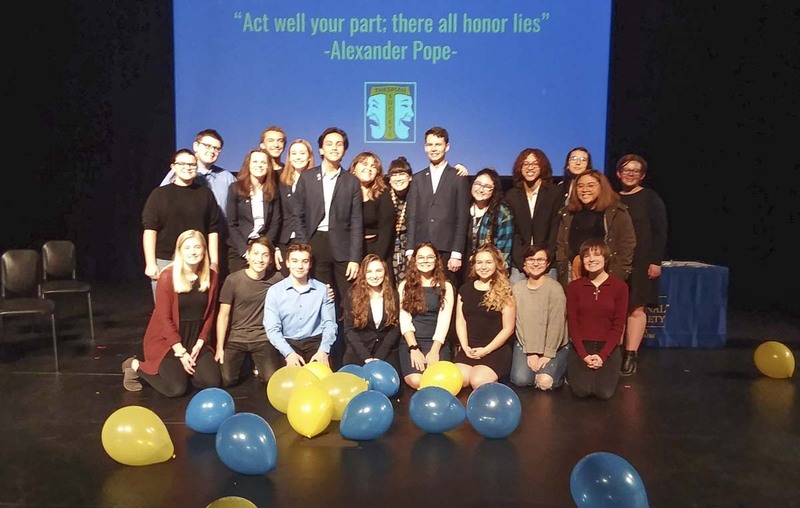 RIDGEFIELD – The Ridgefield High School Thespian Society welcomed six new inductees to the troupe at their mid-year induction on Jan. 10. New to the troupe are: Cami McGravey, Emma Hauser, Kyshaun Summers, Peter Schafer, Clara Lewandowski, Kaitlyn St. John, and Jared Lee. According to Kaitlyn Etter, Theatre Arts director for the high school, students are inducted based on a point system measuring their involvement in the theatre department over the course of their work on multiple productions. “Students are required to have 10 points (100 hours) to be inducted including two points from working “behind the scenes” on a production,” said Etter. The International Thespian Society (ITS) is an honor society that recognizes student achievement in theatre. Etter started RHS’ ITS troupe #8635 last year. “The Thespian Society gives students access to resources beyond Ridgefield, including college scholarships, enhancing college and employment applications, and tons of student leadership opportunities,” said Etter.